Recycled Nonwoven Fabric acts as long-term weed killer. Made with repurposed materials, GGT W.K WEED KILLER is landscaping weed control fabric that delivers 20+ years of weed-free flower beds and gardens. This nonwoven weed barrier, commonly used under walkways and driveways, is also used in walkways and retaining wall projects for materials separation and soil retention. Polyssols, Inc, Spartanburg SC newly developed GGT W.K” WEED KILLER”, a landscaping weed control fabric made from a nonwoven material. Unlike the plastic landscaping material that falls apart after only a few years. W.K. being a nonwoven product is so strong that you are sure to have in excess of twenty plus years of weed free flower beds and gardens. W.K. is also used in many walkways and retaining wall projects. GGT W.K” WEED KILLER purpose is to keep materials seperate and soil retention. Commonly used under walkways and driveways. W.K. 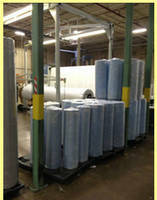 "Weed Killer" A nonwoven weed barrier is also made with these machines. All done with repurposed materials! Polysols, Inc is a green company repurposing recycled textiles materials. Selective Herbicide kills weeds but not grass or other plants. Roadside Management Herbicide simplifies weed control.